MayorMike, inspired by the article I wrote for Make vol. 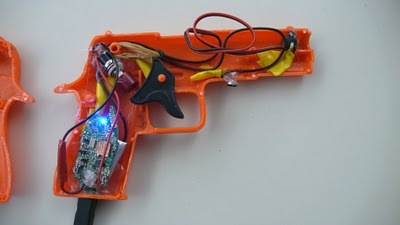 20 (Retro Wireless Handset), stuck a bluetooth headset in a plastic toy gun to create his Handgun Bluetooth Earpiece Project. 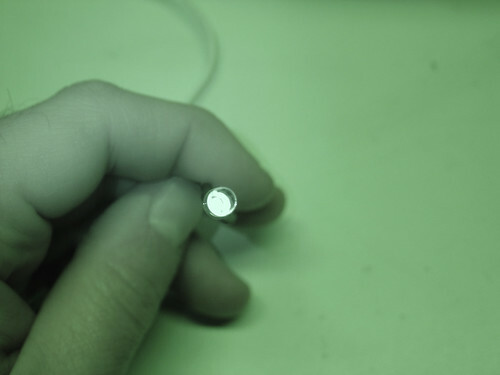 The best part – the earphone is located at the end of the barrel, so to answer a call, you stick it up to your ear. Genius. The innards are shown below. Nice work, MayorMike! May I suggest that you pair this with a Hand Grenade MP3 Player? 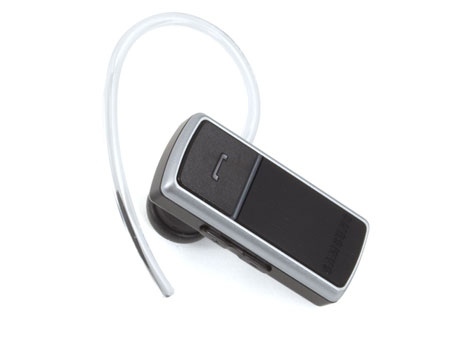 Woot is selling a Samsung Bluetooth headset for $17.99 + $5 S/H – $20 MIR = $3 after rebate. For that price this headset could be a great candidate to use for a DIY Retro Bluetooth Handset. 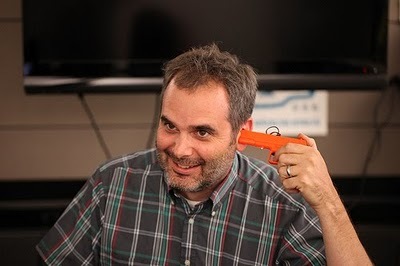 The catch is that I can’t guarantee this headset is actually hackable until someone buys one and reports back here. In this week’s Make: Weekend Project, KipKay shows us how to turn a Bluetooth headset into a retro-styled wireless handset. This project is based on the ‘Retro Wireless Handset’ article I wrote for Make: magazine volume 20. KipKay also posted a pdf version of the article so now you can read about this project even if you’re not a Make: subscriber. Wow, 2010 came a lot quicker than I expected! With one day to spare, here’s a brief look back at some of the highlights of 2009 here at mightyohm.com. 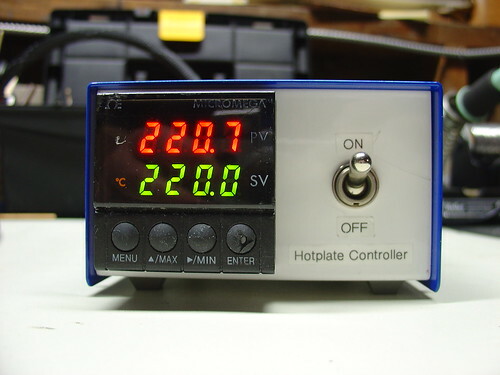 I needed a hotplate for surface mount soldering, so I built one from scratch using a milled block of aluminum, a 500W cartridge heater, and a surplus PID controller. Some of my favorite DIY projects have been building my own tools, and this one is a great example. 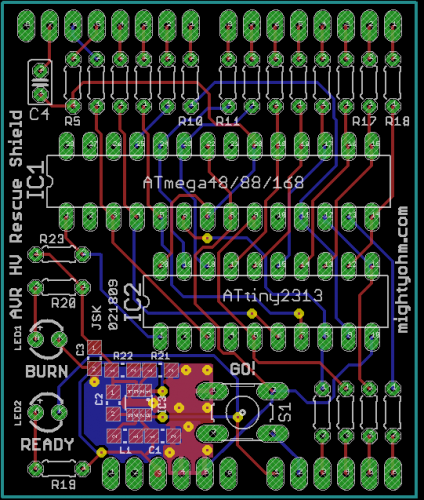 This year saw the release of my first electronics kit, the AVR HV Rescue Shield. 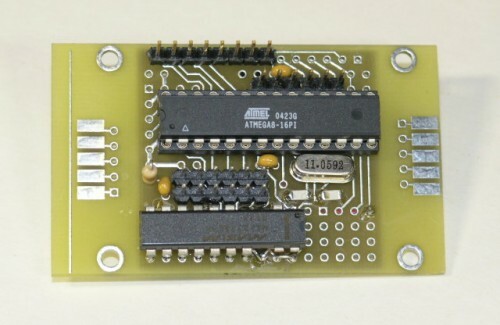 Designed in response to my own experience accidentally setting the RSTDISBL fuse on an AVR microcontroller, the AVR HV Rescue Shield has helped many microcontroller enthusiasts around the world rescue their otherwise crippled, stuck, or deaf AVR’s. After planning out the project and completing a good chunk of the software in 2008, most of the construction of my Wifi Radio project occurred in the early part of 2009. I put the finishing touches on the radio for the 2009 Bay Area Maker Faire. Around the same time the project also made it onto Engadget (and a bunch of other blogs as well). 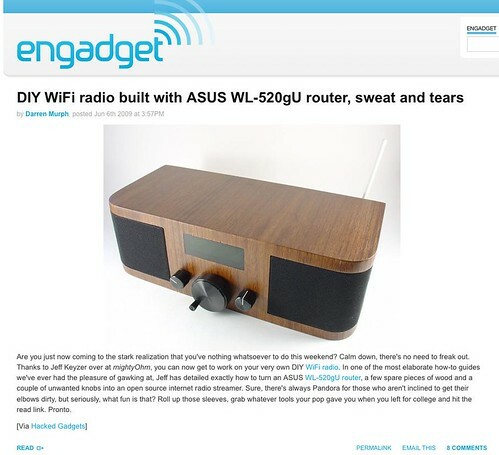 This project continues to be one of the most popular projects on the site and has inspired several other projects based on the Asus WL-520gU wireless router, including an extension to the Adafruit Industries Tweet-a-Watt. In April I flew out to Cleveland and gave a talk about Hacking the Asus WL-520gU Wireless Router at Notacon 6. The con was a huge amount of fun but reminded me just how much work it is to give a talk. I met lots of cool people there, including George Sanger and Jeri Ellsworth, aka The Fatman and Circuit Girl. By the way, the submission deadline for talks at Notacon 7 closes on January 31st! 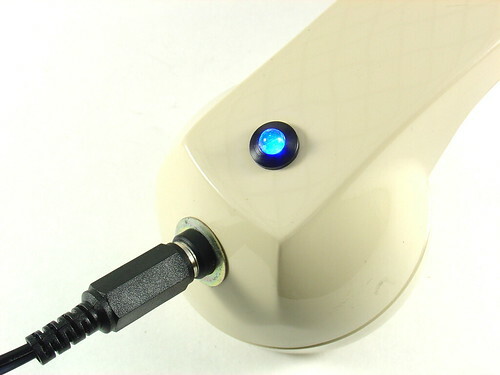 My DIY TiVo IR Blaster was a simple hack constructed in an hour entirely out of parts I already had in the lab. The best part is that eight months later, it’s still working flawlessly. Like any good hack, this one is cheap, simple, and just works. This project, codenamed “Harrison’s Box“, was a collaboration with my wife Kylie and my father-in-law Bill to build an “electronic box” to give to my nephew Harrison’s on his first birthday. 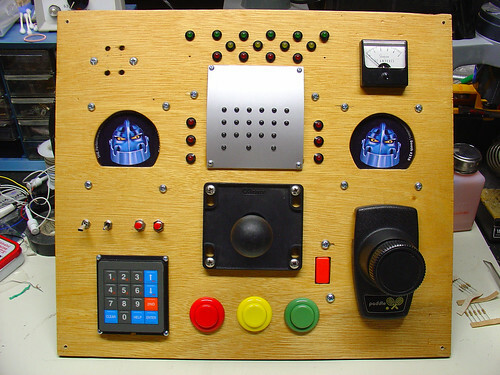 We added as many switches, knobs, and lights as we could. Harrison loved it! I originally posted about my Bluetooth Handset Hack back in November of 2008, but it took exactly one year for the article I wrote about it to finally be published in Make: magazine volume 20. I just learned that my Retro Wireless Handset will be featured in an upcoming episode of the Make: Weekend Projects podcast. Cool! Those are some of the highlights of 2009. 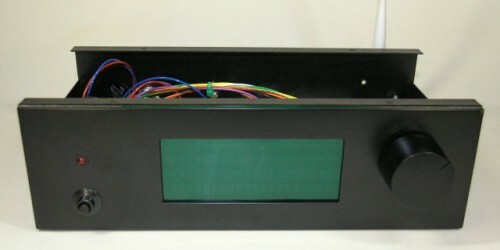 I hope to bring more cool projects, hacks, and kits to you in 2010! Lastly, Happy New Year and a sincere thanks to everyone who has been reading the blog, leaving comments, buying kits, or supporting the site in some way over the past year!